Node community curator Tom DiCostanzo with a fellow resident at the company's newest building, Greene. Are you familiar with co-living, the rental phenomenon where you pay one price for a bedroom in a furnished and wired apartment with cleaning and social events provided? 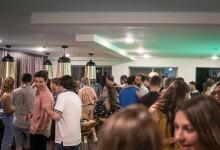 If not, you've got some catching up to do, and there's no shame in not being able to keep them all straight—not only do co-living companies often have names with similar a sound or feel—new ones are cropping up all the time. 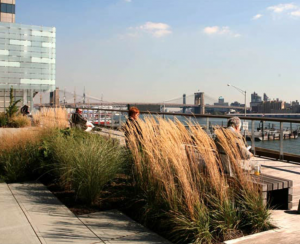 We've rounded up co-living spaces in New York City, attended the opening of one in Williamsburg, and talked one-on-one with a "co-liver" in Long Island City. Next up, a conversation with a resident and community curator at a Node co-living building. Tom DiCostanzo is a 25-year-old actor who hails from Long Island. (You may have caught a glimpse of him on "Saturday Night Live" or in an LG commercial.) He's lived at Node's St. Nicholas Avenue co-living location in Bushwick for a year, and as a curator, provides assistance and information to fellow residents, and plans periodic community events and happenings. 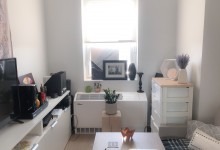 Recently, he shared a three bedroom with two roommates, but in a pattern that is perhaps intensified by the co-living way of life, both have since moved on, with one moving back to Canada, and the other recently became engaged and moved in with her fiancé in Manhattan. Read on for his take on co-living way. What were your initial thoughts about co-living? Co-living was a new concept for me, and I only first discovered it when Node posted on Facebook a listing for an open room. I wanted to learn more, so I immediately booked a viewing. Not only did I feel comfortable as I walked around this newly restored beautiful building, I was excited to (hopefully) begin a new social and professional experience that could really help me grow. Did you look at other co-living spots before choosing Node? I did not. Co-living was completely new to me. I only was familiar with co-working spaces, and worked in one too. So, seeing how that could translate into home life, both socially and professionally, really intrigued me. I chose Node because it just felt like home from the moment I walked in and got a sense of the space and community. How do you think Node differs from other co-living spaces? I think Node has the heart. They care so much about every little detail: where their buildings are located, staying true to the surrounding neighborhood, and every individual ‘Nodie’ resident. Node is also more global than other co-living companies, with communities in Canada and Europe, which makes me feel part of a bigger global community. What is your apartment like? Comfortable but also completely conducive for working at home and staying organized. 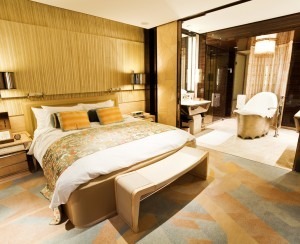 The rooms are interior designed and individually-curated. What’s included in your rent? How much do you pay? There are state-of-the-art appliances like SMEG and Nest, high-quality washers, dryers, dishwashers, and speedy internet. Everything is wrapped in a fixed sum and you never have to worry about set-up. There are also communal areas such as a courtyard, roof deck and residents’ lounge. I pay about $1,400 per month all-in for my room in a three-bedroom apartment, with access to all of these amenities and perks. Who are your roommates? How did you find/connect with them? Node actually did all the matching for me. Node allows residents to meet each other before they commit to live together, through social events or just an introduction someone over a coffee. What are the other residents of the building like? Usually in the millennial generation, though the range is typically from 20s to early 40s. Everyone is driven, creative, and focused—with an explorer mindset. Some are international, from places like Dubai and France, others are more local or from other states. Many are new to the city but you also have a mix of locals, which keeps it really interesting. What is your favorite aspect of co-living? Your least? The community and the option to network with so many different people really helps me grow as an artist. I have yet to discover a con. How do you compare your situation to a regular rental? Joining Node was a breeze, nothing to set up or worry about on my part, compared to other rental situations, where the process can be stressful or daunting. Everything was ready for me at the touch of an (iPhone) button like designer furniture, utilities, roommate matching and socials being organized, and that is a far cry from what my other friends experience as renters, where they have so many hassles getting settled in and and they don’t even know their neighbors. Tell me about your role as curator. I saw the opportunity to both become involved with the local community as well as meet driven entrepreneurs like myself. As a resident I wanted to help create the environment Node can be for its residents. Right now I’m working on more professional networking events and speaker series, hopefully partnering with some of the large companies planted in Brooklyn. Yes I definitely would. It combines convenience with community and is ideal for entrepreneurs and professionals who have busy lifestyles but want to connect with an interesting and diverse group of creative people. It’s definitely made for the modern millennial, the driven entrepreneur, the global citizen as I like to coin us. Creative in more than just art, but in all aspects of their life. That’s to be determined, but for now I see myself staying where I feel comfortable, and that’s definitely Node.